A couple of days ago the Australian Bureau of Statistics released the latest retail sales figures, touching on many of the retail segments services by the ASX listed retailers. Overall sales increased 3.1% for January and 3.4% for the year, and continued to reduce from the strong 6% growth rates seen just three years ago. 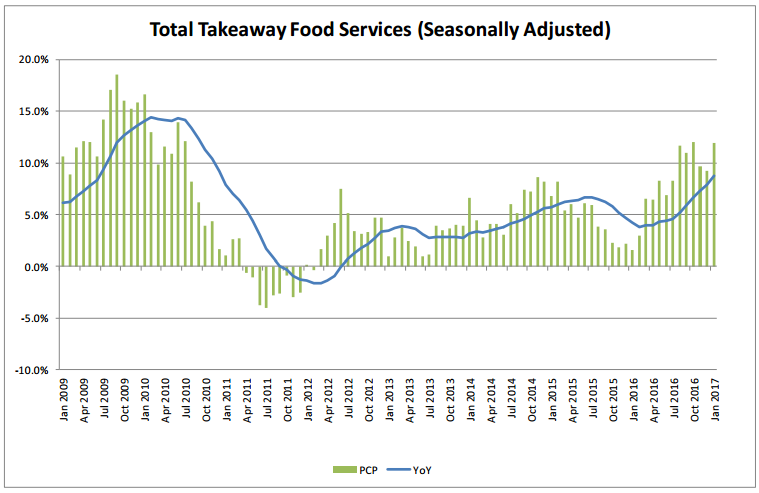 It was a big month for takeaway food services, rising almost 12% from this time last year. The rise of technology in the space is continuing, with the dominant Menulog (acquired for a staggering $855 million in 2015 by Just Eat) leading the way. Menulog is facing competition from Foodora, owned by Delivery Hero, and Deliveroo, both UK based. UberEATS is also moving into the space. With more providers offering quick and easy alternatives to the traditional call into your local pizza shop, the space is set to continue growing, though ASX listed exposure to the trend is limited. 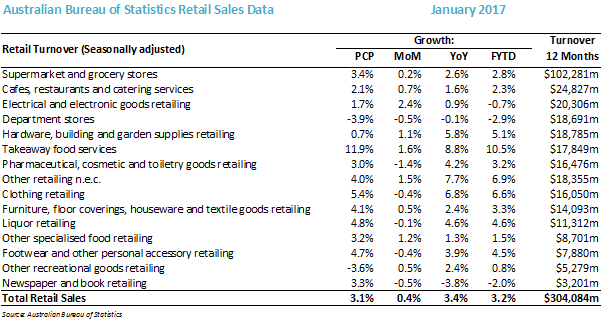 Department store sales was another interesting result, as the decline in sales continued in January, down 3.9% and effectively flat for the year. Myer (ASX:MYR) results for the half are due to be released on March 16, though first quarter same store sales have already been announced at +1.6%. The business has been undergoing a turnaround, with more efficient use of space and margin improvement through cost reduction a priority. Overall, international brands such as Zara, H&amp;M and Uniqlo continue to increasingly compete with Myer and Woolworths and the South Africa owned David Jones. 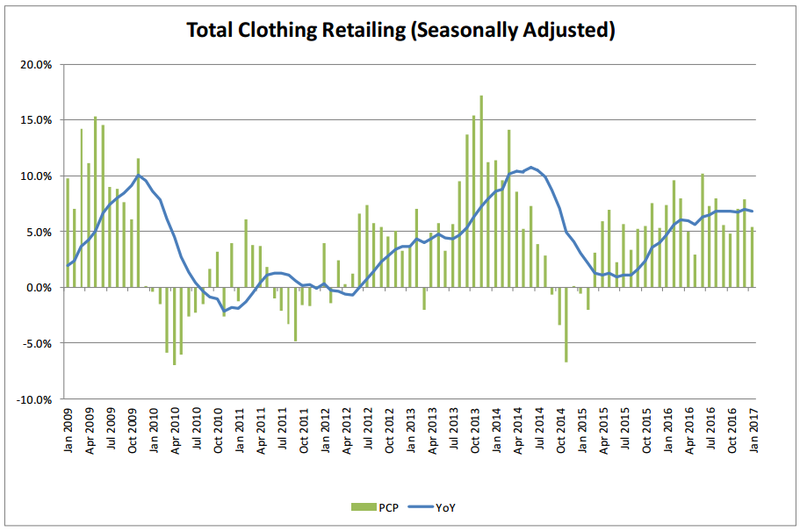 Clothing retailing also saw a strong month, rising 5.4% during January and 6.6% for the financial year to date, with a reasonably positive read-through for Premier (ASX:PMV) through the Just Jeans, Jay Jays and Portman’s store networks. Noni B (ASX:NBL) also stands to benefit through the Rockmans, NoniB and Table Eight brands. While these industry-wide trends are a useful signpost, they provide only a limited view into the sales of individual retailers. 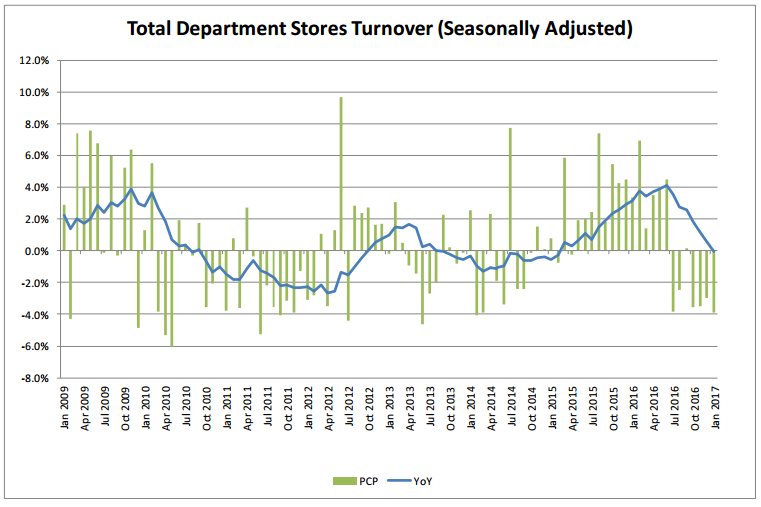 The changes in market share, opening of new stores and the control of both cost of goods and fixed costs for an individual retailer will be a more important indication of future performance.